The community of Omorio dreams of sending their children to school, and are betting on fish to make those dreams a reality. Early this year, the village of Omorio woke early, greeting the morning with anticipation as they prepared to harvest their inaugural fish pond. There are three additional ponds and a fish hatchery planned for this remote region of Uganda. 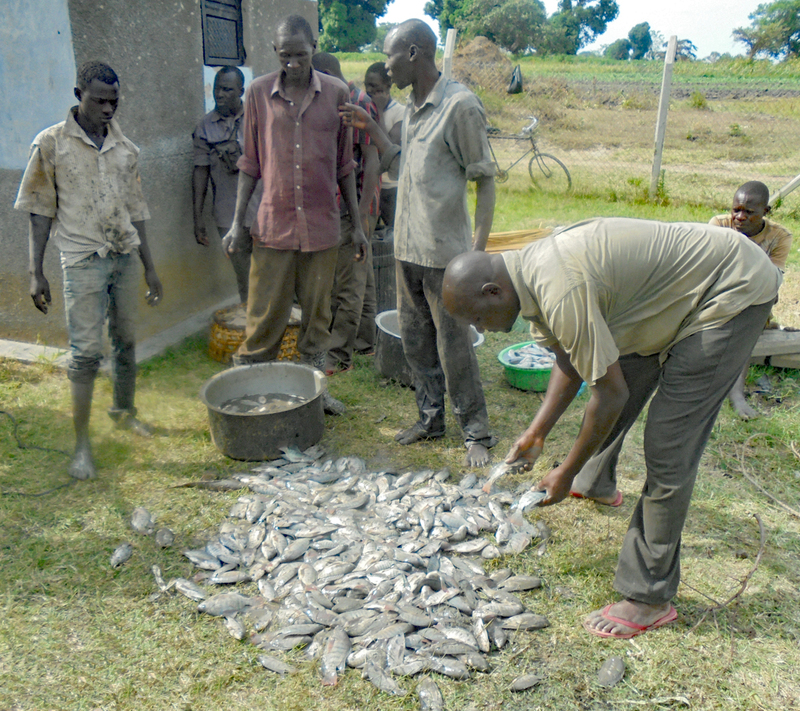 The nearly 5,000 tilapia and 100 catfish fingerlings they’d been carefully tending were ready for harvest and would be heading to markets in surrounding villages, marking an important milestone in this ambitious multi-year project. For these subsistence-farming families in Eastern Uganda, life is a fragile balancing act where basic necessities are scarce. Families live in brick huts with grass roofs and outhouses with doors are considered a luxury. 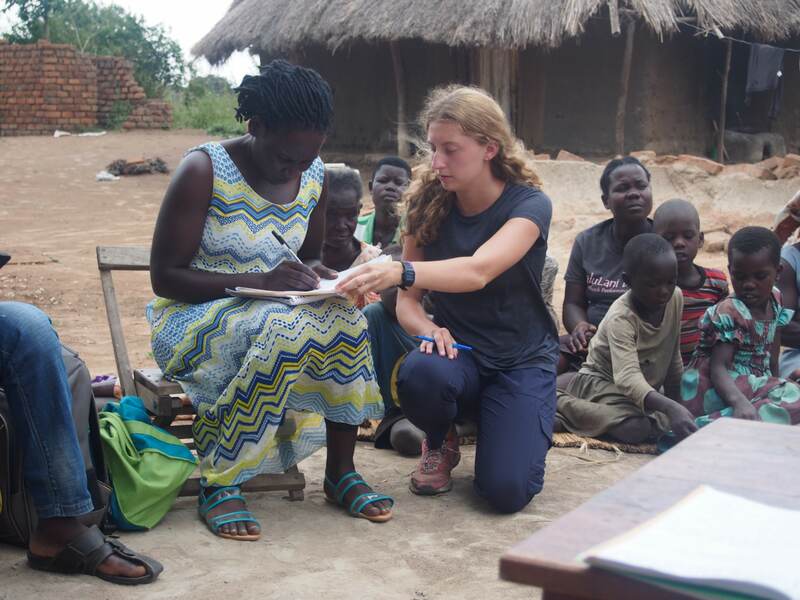 There is no running water or electricity and it is hot and dry most of the year, explains volunteer Destine Hughes, who is co-president of the Engineers Without Borders USA (EWB-USA) Fordham University Chapter. EWB-USA’s Fordham University Chapter adopted this ambitious fish farming project presented to them by the Serere Local Fish Farming Initiative (SELOCOFFI) in Uganda as their inaugural project. The people of Omorio, like 80 percent of Uganda’s population, live in rural areas and are dependent on rain-fed agriculture. This dependency, coupled with a changing climate, brings with it an array of unpredictable events such as drought and erratic rainfall. These conditions make the prospect of branching out beyond traditional agricultural crops a practical, environmentally kind, and necessary investment in securing their futures. Part of that future investment also extends to education. Families participating in this project have made a commitment to use the income generated to send their children to school. In an area of the world where school fees and uniforms are an unaffordable luxury, this commitment could truly alter the educational landscape of Omario. 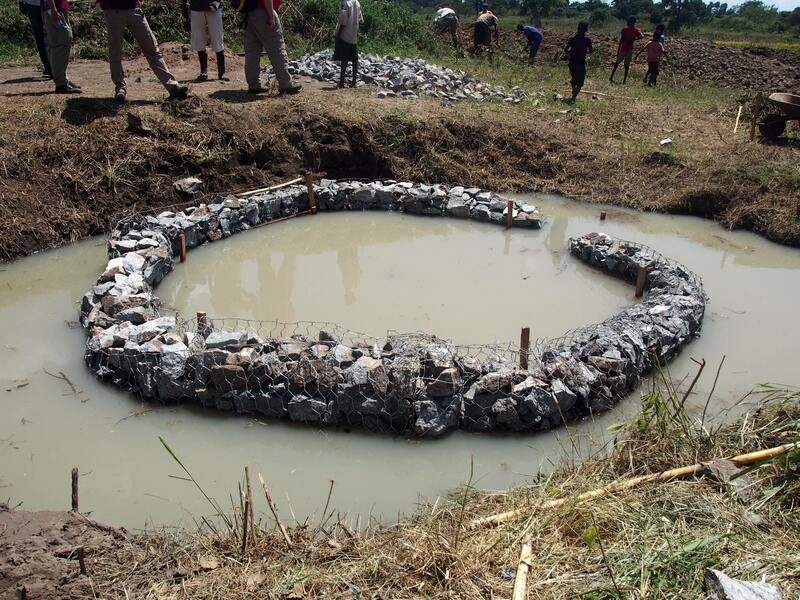 With technical assistance from EWB-USA and our local partner, SELOCOFFI, community members began the grueling process of creating a fishpond. For two months, members of the collective removed wheelbarrows full of earth and dense clay, digging out a 100 by 50 foot sloping pit. At its deepest point, the pond drops a little more than three feet below ground. After excavating the site, the community team fertilized the footprint of the pond, ensuring that algae would grow to provide the fish with food and turn the water green, thus obscuring them from the view of birds, snakes and other would-be predators. Once prepared, the pond was filled from a nearby spring and fingerlings. If properly nurtured, the fingerlings would bring a good price, provide numerous meals, and build excitement around the project. There was a lot riding on these fish. For eight months the people of Omorio tended the pond—feeding the fish, checking water quality and ensuring the safety of this precious crop. In fact, in addition to assistance with the pond, EWB-USA volunteers designed and advised on the construction of a guardhouse for monitoring and securing the pond. Because nets are difficult to procure, the team opted to completely drain the pond in order to harvest the fish. For eight hours, the community watched as the water level dropped to reveal the fruits of their labor. The pond was built on a slope, so as the water level fell the fish swam into the water at the lowest level of the pond, allowing people to gather them in large buckets. After four days, 6,789 fish were gathered, sorted and cleaned. 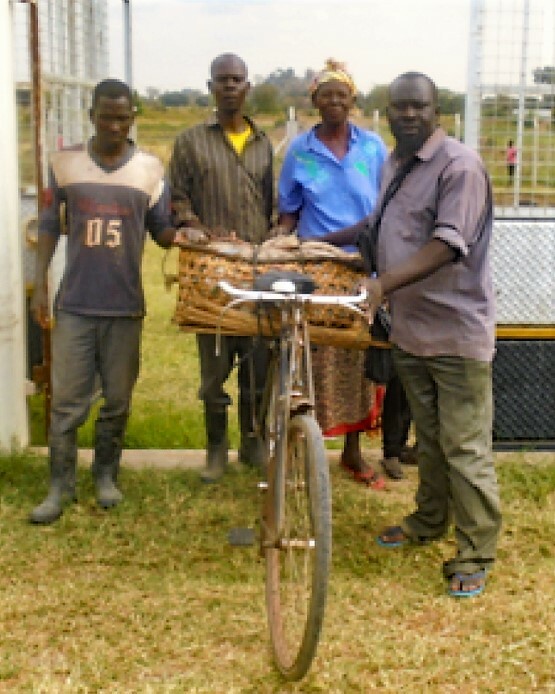 On market day, the fish were carefully packed in large straw baskets attached to bicycles and motorbikes. The “curriers” from the village posed for one last photograph in front of the gate to the pond before pedaling and motoring off to local markets in surrounding towns where the demand for fish is high. By many measures, this first harvest is a success. The fish showed no mortality. In fact, some of the fish had even reproduced—a surprise to many since all the fish had been thought to be male! The sizing of the fish was good, and the products were very well received in the markets. Omorio village community member David Omiat reported that demand for their, “sweet, palatable fish was high,” with the quality surpassing that of other vendors. Now that the inaugural harvest is complete, the EWB-USA project team and our local partners plan on making adjustments to increase community profits and self-sufficiency. Based on fish pricing and sales, the next restocking of the Omorio pond will consist entirely of catfish. In addition, since a large portion of the proceeds from the first harvest will go back into restocking the pond and purchasing fish feed, the team is looking forward to developing a breeding pond. This pond will go a long way toward allowing the community to grow their own fingerlings, stock their ponds and potentially sell any surplus fish to ponds in other communities.